New for the 2016-2017 men’s basketball season, we are proud to announce our partnership with Butler University! All basketball season long, we will present the Chapman Champion award to one deserving Butler University student at every home game. What is the Chapman Champion Award? 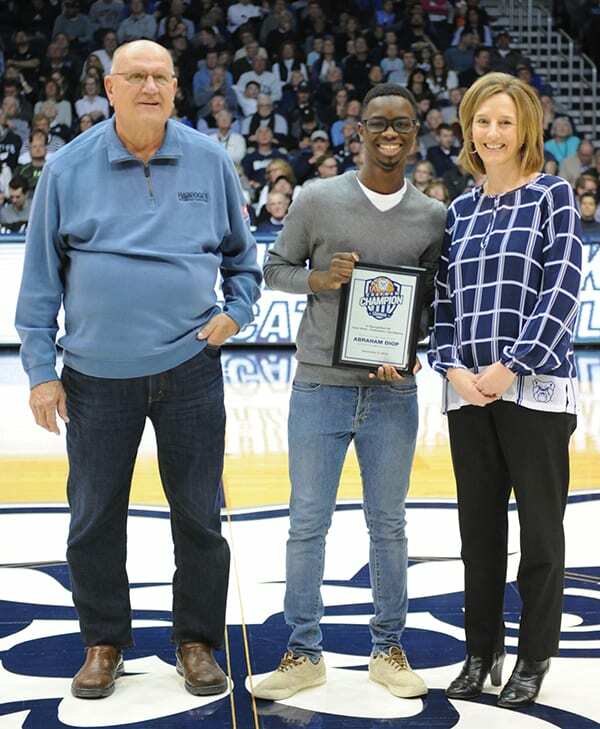 This recognition is given to a student who shows consistent hard work, outstanding team work, dedication and overall excellence in their time at Butler University. Selected for these values, each Chapman Champion represents the hardworking leaders of tomorrow, through their passion and tenacity. Each of our Chapman Champions will receive a custom plaque with their name on it. Champions will be recognized individually in an on-court appreciation presentation during a Butler men’s basketball game at Hinkle Fieldhouse. We feel that hardworking individuals deserve to be recognized and we are proud to partner with Butler University to highlight these outstanding students. Join us at a home Butler men’s basketball game to recognize these students and cheer on our Butler Bulldogs! Check our Facebook page for updates on the Chapman Champions and see pictures from the on-court presentations. Watch the video below to see Jeff awarding the first Chapman Champion award. Mike Freeman, Associate Athletic Director and Jeff Chapman, President of Chapman Heating, Air Conditioning and Plumbing present Butler student, Jimmy Lafakis with the Chapman Champion award on 11/16. Jimmy is from Schereville Indiana and is a Journalism major in the class of 2019. In addition to his studies, Jimmy writes for the Butler Collegian and has helped the sports information department capture nearly every athletic event with his photography skills. He has shown hard work, dedication, and excellence during his time at Butler. Abraham is a sophomore and double major in International Business & Marketing and is also a member of the Student Government Association, the Black Student Union and the Muslim Student Association. He partnered with the Athletic Department and campus groups to run a water drive at a basketball game last season to aid the Flint Water crisis and also organized and carried out a food drive at a football game this past fall. Abraham is a great example of a student that puts others needs ahead of his own. The award was presented by Anne Flaherty, Interim Vice President for Student Affairs at Butler University and John Gavin, representing Chapman Heating, Air Conditioning, Plumbing.